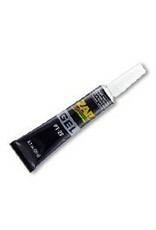 Thickest ZAP of all - great for filling gaps. Super thick formula. 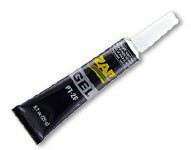 Jelly like concentrated cyanoacrylate adhesive. Will not run or flow. Can be applies to vertical or overhead surfaces. The tube comes with a long tapered tip allowing precise application. The role playing gaming industry uses it for gluing pewter and plastic figures. Fly tiers and custom lure manufactures like it because it stays where they want it. Jewelry makers like the high strength and the ability to apply just the right amount. Model builders also like the high strength features and use it for servo mounts, laminating, gluing plywood, anywhere a fast curing high strength joint is needed. Use Zip Kicker to accelerate cure time. Works best on: Aluminum, Ceramic, China, Metal, Most Plastics, Pewter, Rubber and Wood.